1. 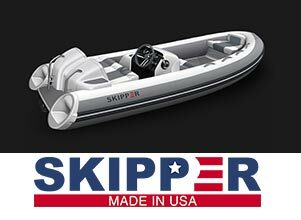 Watch out for that Speeding Ticket: The Skipper 10 equipped with a 30 HP Evinrude ETEC can go 41 MPH with a 200Lb driver at the helm. Wow, bet you didn't know that you will now be the speed champion of your dock, and you have the smallest boat. Get ready to hoist the trophy! Beware, because the Skipper is sooo fast, the officials wearing badges will be looking for you. 2. Hold 5 Passengers: The Skipper 11' comfortably holds five passengers. Two behind the helm console with ample room for a 6’ 2” driver. One on the port side of the console, and one near the anchor locker at the bow of the tender. All seats comfortably provide a safe and secure place for your passengers. Now your family or your friends can come aboard and enjoy the ride. 3. Start an Instant Dance Party: The Skipper’s stereo sounds so good, yachtsmen will wonder how such a small tender can have such big sound. Our stereo is not only equipped with four speakers, it also is installed with a yacht tender in mind. What does that mean for you the owner? It means, it sounds like a million bucks, and soon you will have your own Skipper dance party on or near your tender. 4. Earn Style Points: The Skipper has been known to be compared to several foreign made automobiles. Why? Well, quite frankly, the Skipper's design is highly unique that no other tender can match. The combination of features, hull design, sportiness, speed and overall craftsmanship will turn heads of all your friends, especially those who appreciate quality. Soon, you will be turning heads and earning those well-deserved style points. 5. Behave like an Automobile: The Skipper 10' and 11' are both built with the same technology and intelligence as many fine automobiles on the road today. This computer aided process provides the Skipper with a high degree of build quality, reliability, and a low coefficient of drag as the hull floats through the water. These are just a few of the benefits that you get as a proud Skipper owner. 6. Light up your world: The Skipper 10' and 11' has optional deck lights and underwater lights that make this sporty tender look and feel like you should be in the company of a mega yacht. Of course, we think you should. These lights provide you with a mix of sportiness and elegance that only the Skipper can deliver. Your colorfully illuminated tender will soon be the talk of the dock. 7. Enhance your Colorful Personality: Both Skipper 10' and 11' come in many color combinations that truly make our tenders a one-of-a-kind yacht tender. Our generous selection of color pallets on the Skipper menu will not only wet your appetite with flavor and style, but also accent your own sense of color and personality in ways you never thought possible. Your color choice will be recognized as a cool and creative way to put your signature touch on your Skipper. 8. Keeps you dry: The Skipper 10' and 11' hull design was strategically engineered to be longer at the transom than many other competing tenders. This provides you with an amazingly dry, comfortable ride. This unique design also ensures that your tender will stay on plane, and will not porpoise while you are enjoying the incredible ride of your Skipper.